This cache is awarded as Geocache of the Week by Groundspeaks HQ. Don't pull out, but just twist!! Use tweezer!! N Seoul Tower is a communication and observation tower located in Namsan Mountain, central Seoul, South Korea. Built in 1969, the tower has been a symbol of Seoul. It has also been known as the Namsan Tower or Seoul Tower. After the tower's original owner merged with the CJ Corporation, it was renamed the N Seoul Tower. 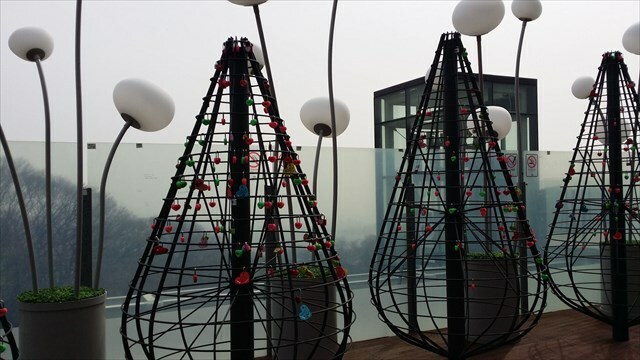 You can see the beautiful scenery of Seoul, from outdoor observation deck, called roof terrace. On the guardrail, there are great many locks hanging, by Lovers, friends and family who hopes their loves and friendships will not change and go along eternally. 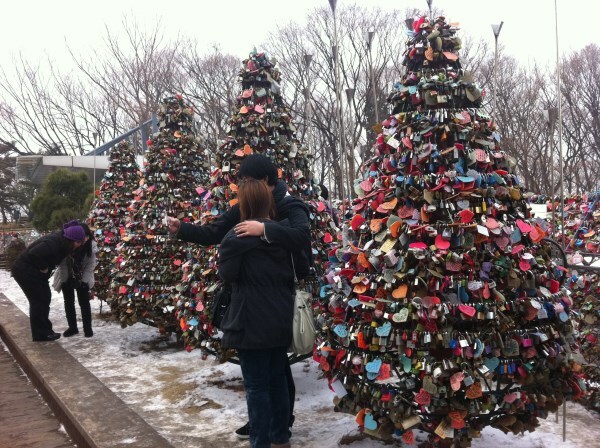 According to http://blog.daum.net/namsan365, the tradition was started in Dec. 2006. However, there are too many locks nowadays and they causes safety problems, so they want to move them safer place, and built tree of love locks. Now you can find 7 trees. The cache is on the 4th (the center) tree. The trees were replaced by new trees for locks glow-in-the-dark only. There are 5 trees now and the cache is on the center(3rd) tree. You can access the N Seoul tower using cable car or circular bus #2 and #3 (Yellow bus). - #6 exit of Dongkuk University station of Line #3. Note: There are so many locks. Must have SPOILER Picture. Don't pull out, just twist. Then the cap will open. 이 캐시는 이번 주의 지오캐시로 지정된 캐시입니다. 자세한 내용은 여기를 참고하세요. N 서울타워는 서울 중심부의 남산에 위치한 통신탑이자 전망탑이다. 1969년 세워진 이래 서울의 상징으로 되었다. 원래는 남산타워 혹은 서울타워라고 불렀으나, 2005년 리노베이션을 거쳐 현재와 같이 N 서울타워로 불리게 되었다. 타워위에 오르면 물론 서울 전역을 볼 수 있지만, 루프테라스에서도 아름다운 서울을 감상할 수 있다. 루프테라스 가드레일에는 엄청나게 많은 자물쇠가 걸려있는데, 사랑과 우정이 변치않고 영원하기를 바라는 연인, 친구, 가족들이 걸어둔 것이다. http://blog.daum.net/namsan365 에 따르면 이 전통은 2006년 12월에 시작되었다고 하며, 현재는 자물쇠가 너무 많아 조망을 해치고 안전상의 문제가 대두되어 제거하였다. 그 대신 7개의 사랑의 자물쇠 나무 설치하였다. 이 캐시는 이 7개의 나무중 4번째(가운데)에 설치되어 있다.예전의 자물쇠 나무는 철거되었고, 현재는 야광 자물쇠만 달 수 있는 5개의 나무가 설치되어 있다. 캐시는 가운데 나무(3번째)에 있다. N 서울타워에 올라가는 방법은 케이블카를 타는 방법과 남산 순환버스 2번 혹은 3번을 타는 방법이 있다. 버스는 지하철 3/4호선 충무로역 2번출구, 혹은 지하철 3호선 동국대역 6번출구에서 탈 수 있다. 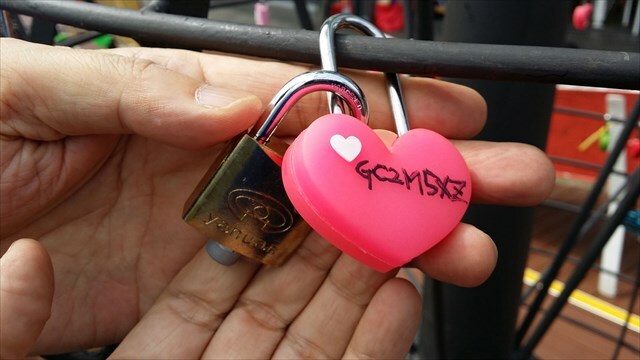 LoveLock caches around the world.